In the below videos Morihiro Saito Sensei (1928-2002) provides instruction on the traditional version of munetsuki kotegaeshi as practised by O’Sensei (the Founder of Aikido) in the immediate post-war period of his life. Munetsuki kotegaeshi is traditionally categorised as a “turn and transform” (kaiten) technique and is practised as a response to a strike or thrust to the stomach (munetsuki). Munetsuki kotegaeshi is sometimes mistakenly considered a beginners technique on the basis that it often appears in early gradings in many schools. In reality, however, nothing could be further from the truth. 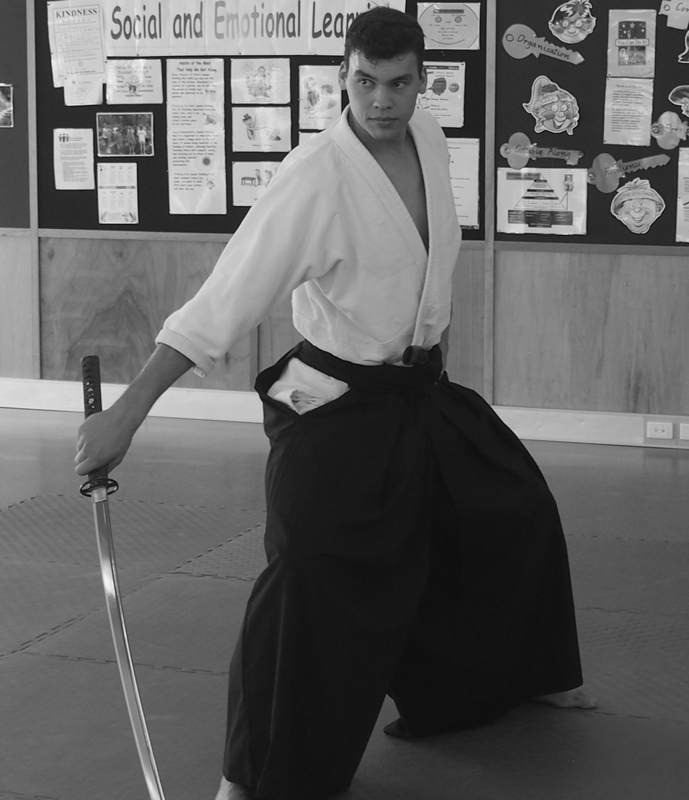 In fact the technique can be quite challenging to effectively perform, particularly against a centred and responsive uke who either resists or is skilled in countering. Effective application of kotegaeshi (regardless of the attack) requires significant skills in entering, timing, sinking, maintaining centre, space, balance breaking and moving as a single relaxed unit. The below photo and drawing show the hand position for executing kotegaeshi. In our school the wrist is not twisted to the side. For video of Maruyama sensei explaining the hand position for kotegaeshi see: Training Notes: Yokomenuchi kotegaeshi. From a martial perspective, atemi (striking) is an important part of Aikido practice. Depending on the source, between 70% and 90% of Aikido requires an application of atemi principles. In the below video, Morihiro Saito Sensei demonstrates the atemi for munetsuki kotegaeshi. In Aikido the uke’s balance is typically not taken by movements of the nage’s upper body, but by the correct movement of the nage’s lower half of their body, particularly the hips. In munetsuki kotegaeshi, for example, the nage’s hand on the uke’s wrist is merely the connection point. However, it is the movement and sinking of the nage’s hips that breaks the uke’s balance. In the below video, Morihiro Saito Sensei, demonstrates how the correct use of the hips and sinking can be used to take the balance of the uke at first contact in munetsuki kotegaeshi. In the below video Christian Tissier Sensei (8th Dan Aikikai) explains the 3 options available for applying kotegaishi and the circumstances that favour one option in preference to another. Saito Sensei spent his teaching life dedicated to preserving the technical style of Aikido as practised and shown to him by O’sensei in the post-war period. Without his commitment to preserving the Aikido of the Founder and extensive efforts to record and document his teachings, much of the Aikido of O’sensei from the post war period would have been lost.